This is yet another eBay find that I'm totally in love with! It's a little mod mini with a red and navy blue heart pattern. So cute! eBay is dangerous, man, I can't stop looking for dresses. It doesn't help that I have the app on my phone, so any time I have a few minutes I check it. I just can't help it! I can find super adorable vintage dresses for under $10, all while I'm in bed watching The Office. 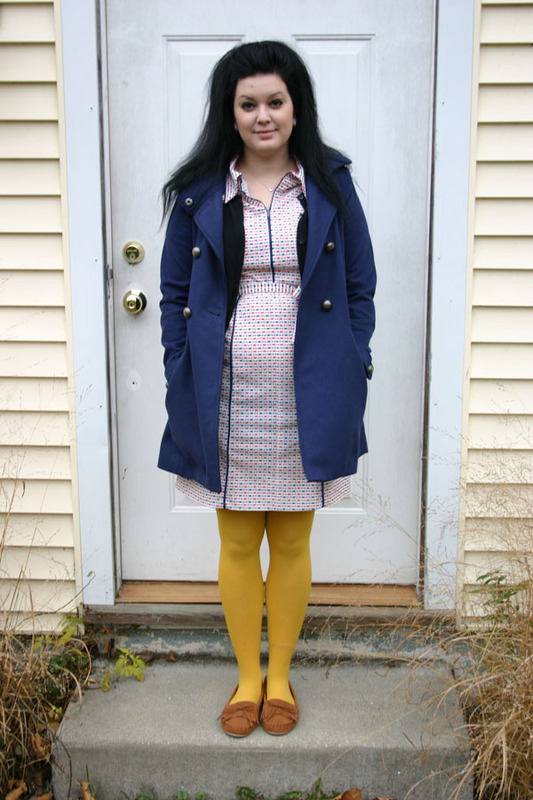 Pretty darn cool :) I paired it with mustard yellow tights, a black cardi, and moccasin (slippers) all from Target. Easy peasy! Speaking of the new month, I hope you'll check out all the lovely new sponsors over there on the right! I'm thrilled to introduce you to a bunch of lovely new faces, and some lovelies you might have seen before! There's a whole lot of awesome over there, so stop by and say hello!! Eee! I have those moccasins, don't you just love them? all things i love: mustard tights, paper snowflakes,being crabby about snow (after loving it when I didn't have to deal with it), and cinnamon pinecones! That is cute, plus I love the tight too!! I've never purchased anything on ebay, that site scares me to death. wahhhhhhh! i wish we could spend the holidays together!!! missss youuu! 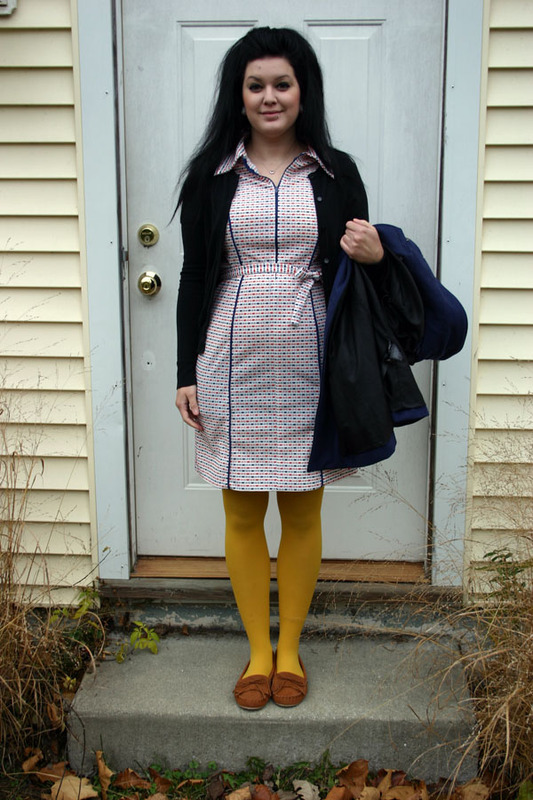 <3 the color of the tights! I love your tights and your hair! Gorgeous ! haven't been around for a while, and i missed your blog! just started blogging again and trying to keep it up this time :) I LOVE that dress! i have ahard time ordering off the internet, nothing ever seems to fit. im so jealous :) lookin forward to catching up! I love everything about this outfit! 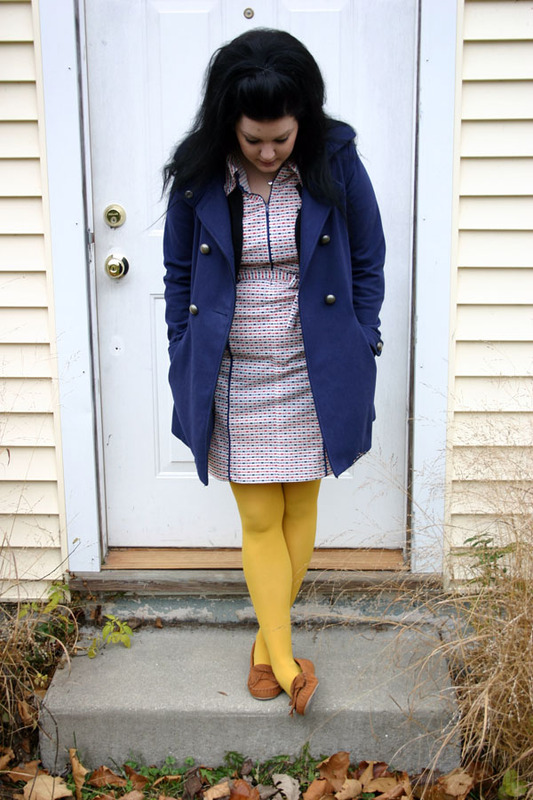 I am currently obsessed with my moccasins and yellow tights and love how you styled that vintage dress! You look so cute!